The iMovR Ziplift comes with a silent Z-Lift gas mechanism. The height-adjustable desk is easy to use and with low noise, it is made for the busy office space. The Ziplift also stands out with its tilted keyboard tray design. 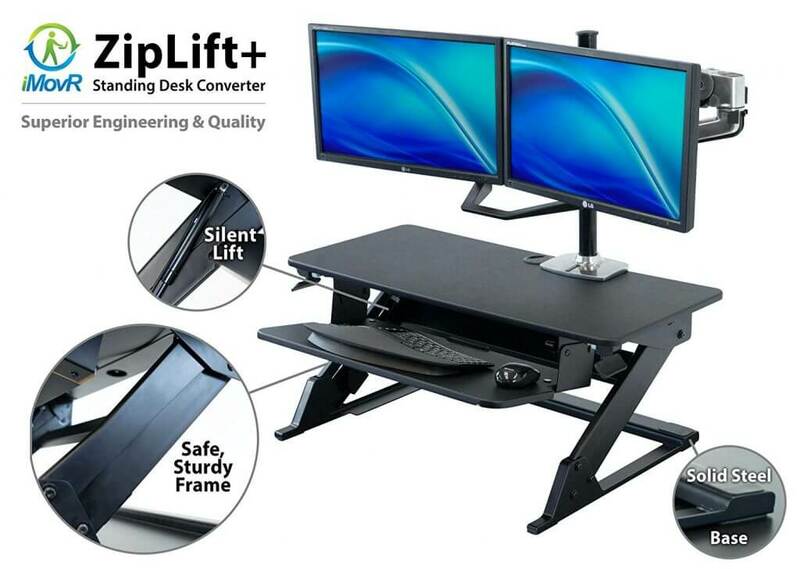 The iMovR Ziplift is one of the main competitors of the Varidesk Pro series. It aims to be a better alternative, especially with characteristics such as height adjustability with no preset levels up to 20in. The iMovR Ziplift is made to be a direct competitor to the Varidesk Pro. Invariably, people will compare the two designs. The manufacturer states that the adjustable desk is considerably better over its Varidesk alternative. 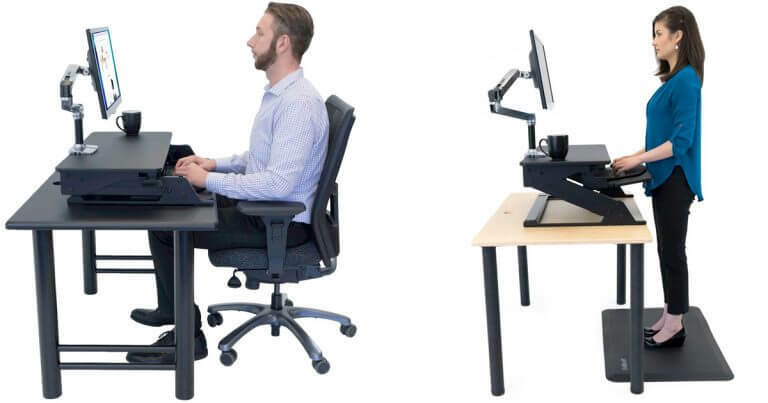 In reality, both standing desks are similar. However, the iMovR Ziplift has the advantage of adjustability and affordability. One of the most interesting characteristics of the desk comes with the freedom of height adjustments. With no height presets such as with the Varidesk, the iMovR Ziplift allows users to set their own height anywhere up to 20in. This adjustment is easy to make. With the help of gas struts, the adjustment is also made with no noise. With an infinite number of stops, there is plenty of room for customization with the iMovR Ziplift. Users of different heights can find the perfect working position with no issues. Even more, the overall comfort also benefits from the iMovR-specific keyboard tray designs. As with other adjustable desks from the manufacturer, the iMovR Ziplift comes with a design which allows plenty of freedom for movement, especially in the conditions in which it tilts the keyboard at different angles. But why is this important? One of the major strains office workers face comes with wrist pain. Without a doubt, those who type for hours know that this can become a long term issue. For this reason, iMovR is one of the few manufacturers focusing on tilting keyboard trays. Even more, it is also important to consider the options at hand when it comes to the standing position. Those who stand influence the comfort of their wrists with the angle adjustability of the keyboard. This allows for plenty of freedom for those who are extra tall, as they are the ones who struggle the most with this issue. 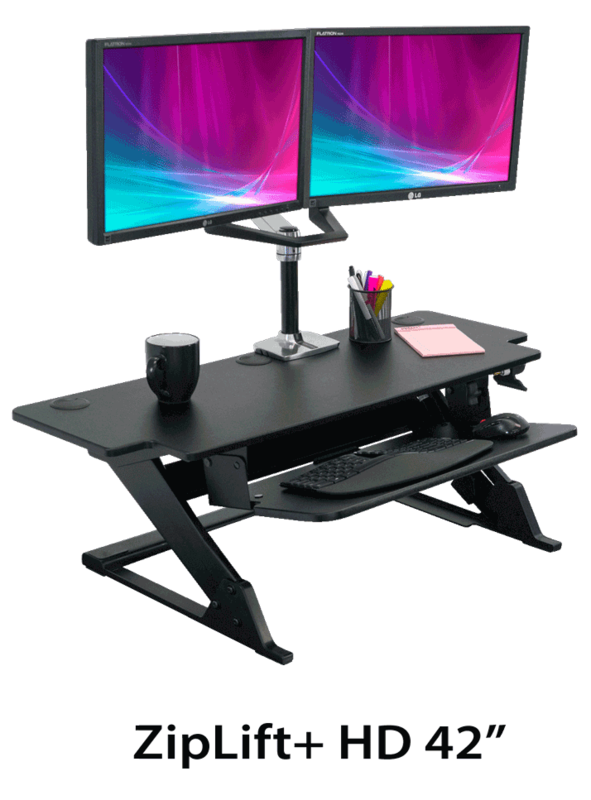 The iMovR Ziplift also allows users to use a laptop or two monitors on the standing desk. Extra monitor arms are available to purchase from iMovR. Apart from all the options at hand for those struggling with full comfort, the iMovR Ziplift also comes with black and white options. But unlike its Varidesk rival, these options are limited. Apart from all these distinct characteristics, the iMovR Ziplift comes with an included standing mat. These mats are typically used to ease the process of standing while working. With reduced foot pain, people are usually able to work better and more comfortably. But the biggest benefit and reason to consider the iMovR Ziplift comes with its tilting keyboard tray design. It takes some time to get used to typing at an angle. But once users use the keyboard tray for a few days, it is easy for this to become the norm. The $299 price is also worth mentioning. Being more affordable than its Varidesk alternative means the product can be one of the entry points to the world of standing at work. Even more, it is also worth considering all the great accessories which can be also purchased from the manufacturer. These include the monitor arm which lifts the display even higher above the standing desk. With a mobile profile, the iMovR Ziplift can be among the products to consider for those wishing to make an impact on their posture. With dedicated functionality and proper comfort, while standing, the desk is easy to use. Installation is non-existent as it comes fully assembled. Standing desks are not perfect. The iMovR Ziplift is one of the main products designed for total freedom of movement. It can be used on any desk. However, it is also somewhat limited. Apart from the lack of options when it comes to colors, the standing desk might feel crammed up to its 42” version. However, as a solution aimed to be temporary and mobile, it can work for most users regardless of their height. The iMovR Ziplift is among the most interesting option for the price. Its compact design might be just enough to get people into standing at work. This is its main purpose after all, but it is easily forgotten due to the complex design. However, the standing desk can be one of the products to consider when a larger standing desk is not an option. It can also be borrowed between colleagues, which should be an interesting experience in itself. Given that standing all day is usually done by adding sitting breaks, it can be a good time to pass the iMovR Ziplift to a colleague. But with a low price point, it comes with a reduced barrier of entry into an active office lifestyle.